were sometimes viewed as evil transformations of common plants. For example, “Uva barbata” (in translation, “bearded grape”), Vitis vinifera(grape wine) parasitized by Cuscuta spp., was considered a monstrous, devilish metamorphosis of the normal grape wine species. Even as late as 1831, in Europe, the presence of dodders in crops was connected to the appearance of the comet in the previous year [Read more here]. Description: go to the description of genus Cuscuta in Convolvulaceae Unlimited. [Hemiparasite = has chlorophyll and does photosynthesis; holoparasite = does not have chlorophyll and cannot do photosynthesis]. Cuscuta are stem parasites. Prior to the contact with the host, seedlings of all species are self-sufficient, some yellow and some autotrophic. The evolution to parasitism has led to a gradual reduction of the photosynthetic apparatus from more hemiparasitic-like species to holoparasitic ones. Species from the more primitive subgenus Monogynella have intact plastids and a low photosynthetic activity. More evolved subgenera, such as Grammica, show major alterations in the ultrastructure of plastids, modifications at the level of plastid transcription, different degrees of reduction of the plastid genome or the total loss of some genes (e.g., rbcL in clade “O” of subgenus Grammica), which impair photoassimilation. But even the greenest species depend almost ENTIRELY on their host plant for water, nutrients, and organic carbon acquisition, which brings them closer from a functional point of view to typical holoparasitic plants. For example, one such hemiparasitic species, Cuscuta reflexa, derives more than 99% of its carbon from the host. Immediately after germination, seedlings found themselves in a life and death race against time to locate and establish haustorial contact with a suitable host. If that does not happen in 1 to 4 weeks, depending on the species, they will die because their root is not only rudimentary but it is also ephemeral. 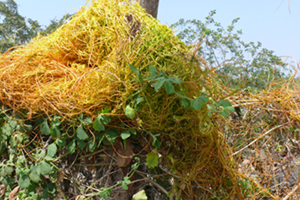 Most authors suggested that Cuscuta sp. lack a ‘true’ root and their seedlings are usually referred to incorrectly as “rootless”. However, a recent study revealed that despite its evolutionary reduction and early degeneration, the root of Cuscuta is capable to absorb water and interact with arbuscular mycorrhizal fungi (form a mycorrhiza). Therefore, they do have “true” root even if much reduced and ephemeral [Read more here]. Dodders have evolved special adaptations to locate and attach to their host. Their seeds germinate relatively late in the season when the potential hosts are already established. Seedlings are capable to orient themselves after green canopies and volatile cues (they can “see” and “smell” the hosts!). As a result, Cuscutasp. selectively forage in plant communities pretty much like herbivores. Stems twine anticlockwise around the stems of the host; they form numerous small haustoria that penetrate the tissues of the host and reach its vasculature establishing a biochemical and physiological channel. But the haustorium is more than a feeding conduit; it is involved in the translocation of mRNA, it is responsible for the transfer of viruses, mycoplasmas, and macromolecules from one host to another, and it may be involved in the horizontal gene transfer. The attachment to the host and invasion of haustoria are extremely elaborate mechanisms designed to match the biological processes of their host and bypass their defense mechanisms [Read more here]. Once established on the host, shoots grow very fast, up to 2 mm in 1h! Total length of the stems reached about 750 m in plants of Cuscuta polygonorum, which is one of the smaller dodders parasitic on herbaceous plants. The more vigorous species can grow 10 times as large! Growing stems of different ages of the same plant interconnect among themselves through haustorial connections, a phenomenon known as self-parasitism. As a result, the plant becomes a complex tri-dimensional network of stems, which may optimize the distances that assimilates must travel within the same plant. One single Cuscuta plant can parasitize simultaneously hundreds of hosts in a plant community. Some 15-20 Cuscuta sp. worldwide are serious pests that can cause up to 80% yield losses in many crops. In addition, dodder seeds are important contaminants, especially of small-seeded forage legumes. Seed contamination represents the main way many of these species have spread, and as a result, most countries have developed legislations that prevent the entrance of contaminated seed lots [Read more here]. Although Cuscuta sp. are usually not mentioned among toxic plants in North America, there are some sporadic reports of toxicosis in rabbits, horses and cattle. Some dodders have beneficial uses. Cuscuta sp. (e.g. Cuscuta chinensis) have long been used in folk medicine, and more recently they have been extensively investigated as medicinal plants. Some species were used as a dye (e.g., Cuscuta tinctoria), and others were found to have antifungal or insecticidal effects [Read more here]. More importantly, Cuscuta sp. are keystone species in their ecosystems. They have the capacity to reduce hosts’ biomass and alter hosts’ allocation patterns, as well as to significantly modify the structure of plant communities. For example, although it represents less than 5% of the total vegetation biomass, Cuscuta pacifica (C. salina var. major) from western North America plays a key role in maintaining diversity in salt marsh plant communities. In its absence, Frankenia salina and Limonium californicum are eliminated by the competitively superior Salicornia virginica. However, because Cuscuta pacifica parasitizes preferentially the latter, the former two species can expand, and therefore the diversity of the community increases. Although they represent a small fraction of ecosystem biomass, they impact multiple trophic levels and they alter all of the abiotic factors [Read more here]. Some Cuscuta sp. are “specialists” with a narrow host range, while others are “generalists” capable of parasitizing numerous species from various families. But even species with a wide host range may show a preference toward certain species, a cultivar, a population or even a certain individual plant. The successful location of a host and its initial penetration by haustoria does not necessarily imply a successful subsequent parasitizing process. Cuscuta sp. may develop poorly or not at all on certain hosts. For example, it was reported that Cuscuta campestris, the most common species worldwide did not survive on Azolla caroliniana, Equisetum arvense, Elaeocharis rostellata, Atriplex sp., Amaranthus retroflexus, Portulaca oleracea, Brassica nigra, Glycine max, Vicia villosa, Arctium lappa or Tanacetum vulgare. Host plants are capable to defend themselves by preventing the haustoria either to reach vascular bundles, or to become functional. For example, layers of lignified or water-storage tissue, present outside the vascular cylinder of the host, may passively delay or prevent the advancement of searching hyphae. In addition, some host species are capable of actively defending themselves by developing novel barrier tissues, by deposition of newly formed wall material against advancing hyphae, or by producing phytoalexins or other inhibitors. Since the penetration of haustoria involves cell to cell communication, the secret of a successful defense can be probably found at this level [Read more here]. Host specificity is an important evolutionary force and a crucial life history trait for dodders. The pest dodders are all “generalists” that can indiscriminately parasitize plants from numerous families and genera. Representatives of this category include: Cuscuta campestris which is almost cosmopolitan in its distribution; Cuscuta indecora found across North and South America; Cuscuta americana from S America, West Indies, and parts of N America; Cuscuta gronovii in N America; as well as Cuscuta reflexa and Cuscuta japonica, mainly found throughout Asia, but locally introduced in other areas as well. The corollary of this observation is that “specialist” dodders, restricted to unique host genera or species, tend to have conservation problems. Among such species are Cuscutajepsonii on Ceanothus, Cuscuta warneri on Phyla (Verbanaceae), Cuscuta polyanthemos on Chamaesyce (Euphorbiaceae), Cuscuta attenuata on Iva annua(Asteraceae), Cuscuta veatchii on Schinus discolor (Anacardiaceae). To destroy or to conserve?